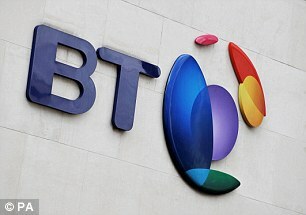 BT is to open help kiosks in its EE mobile phone shops as it tries to repair its battered reputation for customer service. The telecoms giant said the helpdesks are being rolled out to 620 existing stores, with another 30 to open in the next seven months. BT was voted Britain’s worst firm for shoddy service by Daily Mail readers in 2017, 2016 and 2014. In a series of pledges yesterday, BT also promised to stop using foreign call centres to answer customer queries by 2020.